Article breaks the myth that Shorts and Skirts are only summer wears, it comes up with 4 innovative styles of wearing them during winter. We at Leatherfads pride ourselves on being leather enthusiasts but there is another rebellious side, which we are very much proud to uphold from time to time. We consider ourselves as modern day ‘Fashion Myth Busters’. We pride ourselves on breaking long held style myths and there is no better forum to do this that on our blog. Today we are going to break the myth about shorts and skirts, which are perceived to be strictly summer wears. We believe that they can be worn well during winter too. Today’s article looks at breaking this myth as we recommend 4 unique and innovative ways of wearing them for winter. Your fashion storehouse will many at times be in the midst of your own homes. 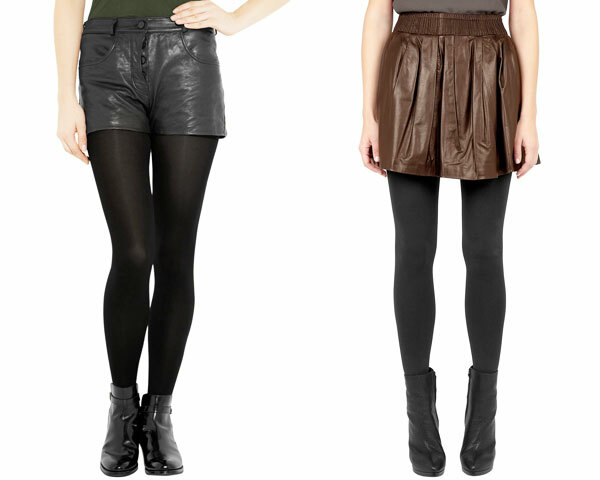 Therefore, before you go for winter shopping try to look out for outfits like hosiery apparels from your own wardrobe. These can be great inner wear when worn with the right shorts and skirts. Tights are not just skin hugging apparels but they also keep you warm and cosy. When paired along with a matching skirt, a short colored tight is a great fashion statement. Just check out the girl in the picture, isn’t she looking glamorous? If you are feeling bold, try them with thigh-high socks or boots. Pairing your tartan apparels with thigh high socks is great way to sizzle up the temperature around you. Today being Valentine day this is great way to impress your loved ones; you can even consider wearing boots to look dazzling. These will give you celebrity style inspiration and you will look in every manner like one. Leather is a great piece and can be paired with a variety of tops. Try being a little innovative and purchase apparels that match your personality. On a concluding note hope you have enjoyed reading the article above, in case you have a few original ideas of your own, do let us know, and always be innovative and sport your style.